London is cold. Colder since the tragic events in Mumbai, and the deep sense of helplessness that permeates, escalated by the sheer distance I am from the city I call home. I grew up in South Bombay. As a young couple, my wife and I walked in the monsoons in those streets - the pattering of raindrops a vivid memory now scarred by the images of bullets indiscriminately splattering those roads. As a teenager, I had my first beer with friends at the Leopold Cafe, at a table now riddled with shrapnel and stained by the blood of those who came after me. Mumbai is no stranger to terror. As a citizen of Mumbai, neither am I. A faded memory of an evening in March 2003 comes back to me. A month after I had started work as an advertising executive, I was waiting for the local train that would take me home on my daily commute from Parel Station to Kanjur Marg. The train was crowded when it arrived, and since I had left office relatively early and recently afforded myself the simple luxury of a First Class Pass, I forsook it for a pav vada (the staple station snack for many of the 6.6 million commuters on the suburban rail) and a lukewarm Fresh Lime Soda. I took the next train, which inadvertently stopped when I reached Ghatkopar. I still recall the haunting premonition that preceded the sound of a hundred cell phones around me. The first class compartment of the earlier train, two stations ahead of us at Mulund, had been blown apart by a terrorist bomb. 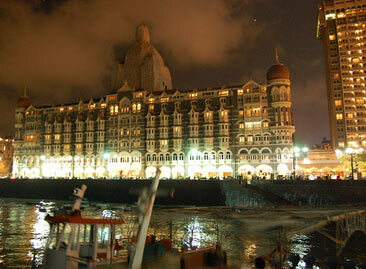 It was a day after the 10th anniversary of the serial blasts that rocked Mumbai. I went to work the next day, as did everyone else - as much a display of defiance as a reflection of the commercial reality underpinning the DNA of every Mumbaikar. I will go to work tomorrow as well. But a piece of me has been torn asunder - by every bullet that riddles the roads I grew up on, and every drop of blood that stains the railway platform I took my train home from for so many years. Tales of horror and heroism are now trickling in from the Taj, where I worked at the Ginger office. They speak of those who barricaded the rooms of the Chambers where corporate India's deals are struck - a human shield no match for the grenades lobbed. The General Manager of the hotel, Mr. Karambir Singh Kang, helped the security forces and commandos with their plans to break the siege, helpless to save his wife and children, still trapped in the burning suite six floors above. When Mr. Ratan Tata, whose great-grandfather built this landmark, eight years before the Gateway of India came up, told him how sorry he was, he apparently responded, "Sir, we are going to beat this. We are going to build this Taj back into what it was. We're standing with you. We will not let this event take us down." If men like him can muster such courage, be so firm in their resolve, so deeply committed to something beyond their personal self, humanity must prevail. Jatayu will fly again!